Institute of Chartered Accountants of India (ICAI) has made it mandatory for all Member Chartered Accountants (CAs) in practice to register all certificates at UDIN portal, which are issued on or after 1st February 2019. 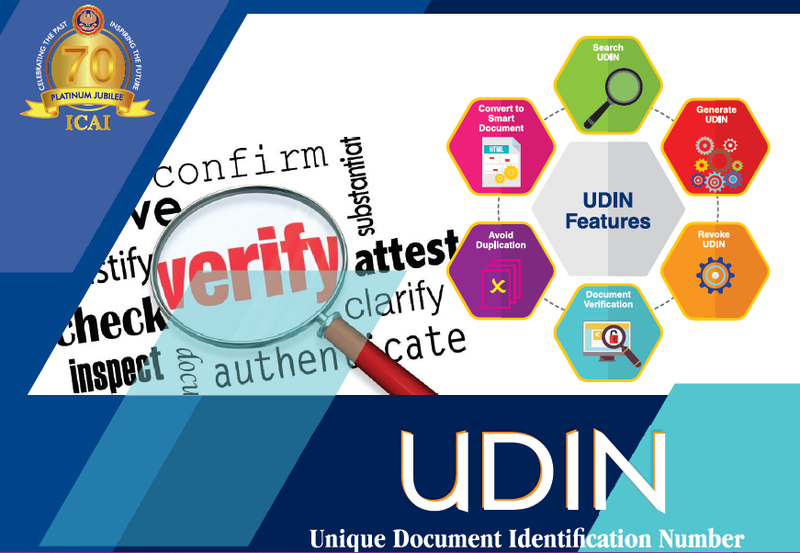 An 18-digit Unique Document Identification Number (UDIN) is required to be generated via system as unique number for every document certified/attested by every Practising Chartered Accountants. It has been observed that financial documents / certificates are often attested by persons misrepresenting themselves as Member Chartered Accountants and thus mislead regulatory authorities and other stakeholders. ICAI has also received a number of complaints of signatures of CAs being forged by non CAs. To curb these malpractices, the Professional Development Committee of ICAI has implemented this concept of UDIN i.e. Unique Document Identification Number. ICAI reportedly has more than 2.92 lakh members and full time Practicing CAs can register themselves by visiting https://udin.icai.org and generate UDIN by registering the certificates attested/certified by them. UDIN is applicable in the case of Utilization Certificate given by a CA for grants to an NGO and thus UDIN will allow funding agencies to verify the authenticity of the Auditor’s Utilization Certificate. UDIN will be a unique number which will be generated for each and every document type certified or attested by Practicing Chartered Accountant. Responsibility to generate and quote UDIN in each such certificate is with Chartered Accountant and not on the NGO. However, it is advisable for NGOs to ask auditor to quote UDIN on each such utilization certificate. It is expected that over time funding agency will not accept Utilization Certificates without UDIN. UDIN is totally secure and can be viewed only by the CA Members and/or the Regulators or other Stakeholders who have the UDIN.